Wholesale Snowmobile Covers. Both Standard and Deluxe Covers to choose from. Three sizes available in each. Our snowmobile covers are durable, lightweight and are perfect for a wide variety of makes and models. The Standard SM Series has a One Year Warranty and the Elite Deluxe carries a Two Year Warranty. They now come in four sizes with an elastic hem and straps to ensure a nice, tight fit. Suggested Retail Price $39.99 and $99.99 respectivly. 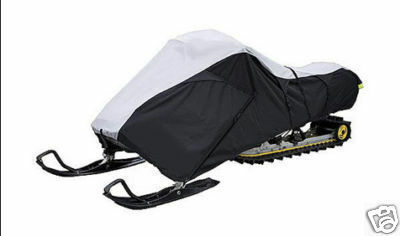 This cover fits Snowmobiles up to 100"L x 51"W x 48"H.. The color is a sporty two tone grey and black. It features a heavy, extremly durable 600D fabric that is treated during the manufacturing process to help weatherproof the fabric for maximum water resistance and repellency. An extra soft non-scratch hood liner was added to protect your snowmobile's paint job. The Elite Deluxe Snowmobile Cover has a Mildew resistant fabric that also protects against rain, snow, dirt, dust and harmful UV rays. There is a strong elastic hem cord around bottom of cover to help ensure a tight fit. Also included are built-in tie down straps with quick release buckles to keep cover secure while trailering. Some of it's added features iiclude a fuel tank access door, reflective rear safety markings and a free sew-in storage bag. 2 Year Warranty. Suggested Retail Price: $99.99. This cover fits Snowmobiles up to 115"L x 51"W x 48"H.. The color is a sporty two tone grey and black. It features a heavy, extremly durable 600D fabric that is treated during the manufacturing process to help weatherproof the fabric for maximum water resistance and repellency. An extra soft non-scratch hood liner was added to protect your snowmobile's paint job. The Elite Deluxe Snowmobile Cover has a Mildew resistant fabric that also protects against rain, snow, dirt, dust and harmful UV rays. There is a strong elastic hem cord around bottom of cover to help ensure a tight fit. Also included are built-in tie down straps with quick release buckles to keep cover secure while trailering. Some of it's added features iiclude a fuel tank access door, reflective rear safety markings and a free sew-in storage bag. 2 Year Warranty. Suggested Retail Price: $99.99. This cover fits Snowmobiles up to 130"L x 51"W x 48"H. The color is a sporty two tone grey and black. It features a heavy, extremly durable 600D fabric that is treated during the manufacturing process to help weatherproof the fabric for maximum water resistance and repellency. An extra soft non-scratch hood liner was added to protect your snowmobile's paint job. The Elite Deluxe Snowmobile Cover has a Mildew resistant fabric that also protects against rain, snow, dirt, dust and harmful UV rays. There is a strong elastic hem cord around bottom of cover to help ensure a tight fit. Also included are built-in tie down straps with quick release buckles to keep cover secure while trailering. Some of it's added features iiclude a fuel tank access door, reflective rear safety markings and a free sew-in storage bag. 2 Year Warranty. Suggested Retail Price: $99.99. This cover fits Snowmobiles up to 145"L x 51"W x 48"H. The color is a sporty two tone grey and black. It features a heavy, extremly durable 600D fabric that is treated during the manufacturing process to help weatherproof the fabric for maximum water resistance and repellency. An extra soft non-scratch hood liner was added to protect your snowmobile's paint job. The Elite Deluxe Snowmobile Cover has a Mildew resistant fabric that also protects against rain, snow, dirt, dust and harmful UV rays. There is a strong elastic hem cord around bottom of cover to help ensure a tight fit. Also included are built-in tie down straps with quick release buckles to keep cover secure while trailering. Some of it's added features iiclude a fuel tank access door, reflective rear safety markings and a free sew-in storage bag. 2 Year Warranty. Suggested Retail Price: $99.99. EBK-SM0 - Economy Snowmobile Cover Size 0 fits up to 100"
THIS COVER IS ON BACK ORDER. This Smaller snowmobile cover is durable, lightweight and are perfect for a wide variety of makes and models. They will stand up to the test and have a 1 YEAR LIMITED WARRANTY to back it up. They come in three sizes to ensure that we have a snowmobile cover for you. These covers have a fully elastisized trim to give the cover a nice tight fit. Approx. 3lbs. The demensions are 100"L x 51"W x 48"H. Suggested Retail Price $44.99 and up. EBK-SM1 - Economy Snowmobile Cover Size 1 fits up to 115"
This Medium size snowmobile cover is durable, lightweight and are perfect for a wide variety of makes and models. They will stand up to the test and have a 1 YEAR LIMITED WARRANTY to back it up. They come in three sizes to ensure that we have a snowmobile cover for you. These covers have a fully elastisized trim to give the cover a nice tight fit. Approx. 3lbs. The demensions are 115"L x 51"W x 48"H. Suggested Retail Price $44.99 and up. EBK-SM2 - Economy Snowmobile Cover Size 2 fits up to 130"
This Larger snowmobile cover is durable, lightweight and are perfect for a wide variety of makes and models. They will stand up to the test and have a 1 YEAR LIMITED WARRANTY to back it up. They come in three sizes to ensure that we have a snowmobile cover for you. These covers have a fully elastisized trim to give the cover a nice tight fit. Approx. 3lbs. The demensions are 130"L x 51"W x 48"H. Suggested Price $44.99 and up. EBK-SM3 - Economy Snowmobile Cover Size 3 fits up to 145"
This X Large snowmobile cover is durable, lightweight and are perfect for a wide variety of makes and models. They will stand up to the test and have a 1 YEAR LIMITED WARRANTY to back it up. They come in three sizes to ensure that we have a snowmobile cover for you. These covers have a fully elastisized trim to give the cover a nice tight fit. Approx. 3lbs. The demensions are 145"L x 51"W x 48"H. Suggested Retail Price $44.99 and up.